Just imagine — a brownstone pub of your own near Yankee Stadium where all the locals go to grab a cold one and talk about Pinstripes' stats. 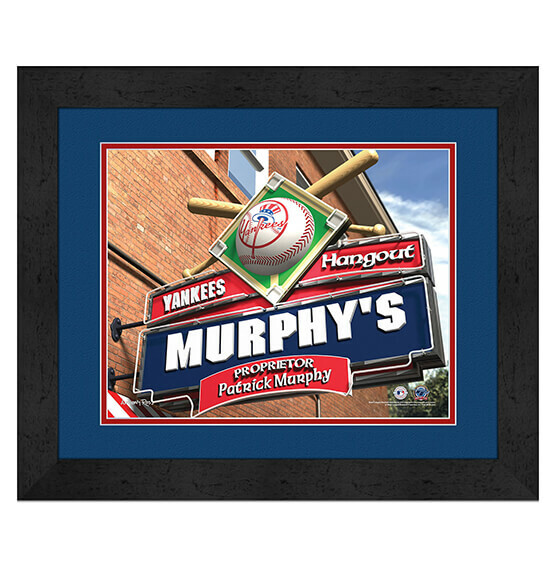 The dream can be a reality (sort of) with our New York Yankees Personalized MLB Pub Sign Framed Print decor. We will print whatever name or nickname you specify. This New York Yankees sports decor is excellent as a gift or to purchase for yourself as a must-have addition to your Yankee fan zone. High-quality MDF vinyl-wrapped frame, vibrant team colors and logos as well as premium glass add to the elegant look of this Yankees pub sign. This piece will arrive directly to your door ready to hang.